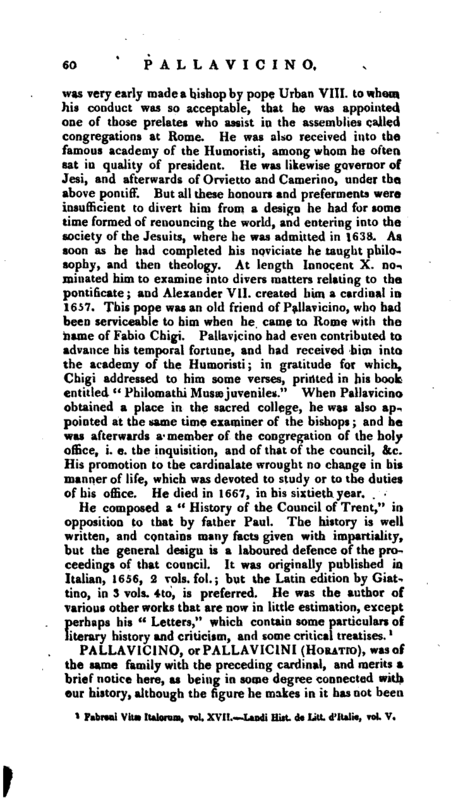 , an eminent cardinal, was the son of the marquis Alexander Pallavicini and Frances Sforza, and born at Rome in 1607. Although the eldest son of his family, yet he chose the ecclesiastical life, and | was very early made a bishop by pope Urban VIII. to whom his conduct was so acceptable, that he was appointed one of those prelates who assist in the assemblies called congregations at Rome. He was also received into the famous academy of the Humoristi, among whom he often sat in quality of president. He was likewise governor of Jesi, and afterwards of Orvietto and Camerino, under the above pontiff. But all these honours and preferments were insufficient to divert him from a design he had for some time formed of renouncing the world, and entering into the society of the Jesuits, where he was admitted in 1638. As soon as he had completed his noviciate he taught philosophy, and then theology. At length Innocent X. nominated him to examine into divers matters relating to the pontificate; and Alexander VII. created him a cardinal in 1657. This pope was an old friend of Pallavicino, who had been serviceable to him when he came to Rome with the name of Fabio Chigi. 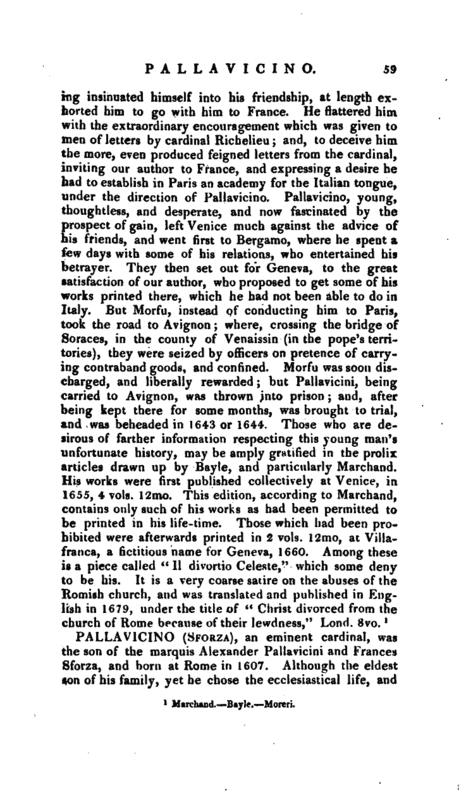 Pallavicino had even contributed to advance his temporal fortune, and had received him into the academy of the Humoristi; in gratitude for which, Chigi addressed to him some verses, printed in his book entitled “Philomathi Museb juveniles.” When Pallavicino obtained a place in the sacred college, he was also appointed at the same time examiner of the bishops; and he was afterwards a member of the congregation of the holy office, i. e. the inquisition, and of that of the council, &c. His promotion to the cardinalate wrought no change in his manner of life, which was devoted to study or to the duties of his office. He died in 1667, in his sixtieth year. Fabroni Vitæ Italorum, vol. XVII.—Landi Hist. de Litt. d’Italie, vol. V.